Rawat Vongla paints Phra Mae Thoranee with a soft palette of golden acrylics. Phra Mae Thoranee is an earth deity, well-known for her appearance as the witness to lord Buddha’s merits when he was being challenged by the evil Mara. 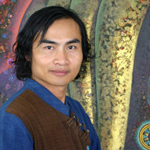 The artist signs and writes his name in Thai at the bottom of the painting. Buddha sat down under a Bodhi tree to reach enlightenment. 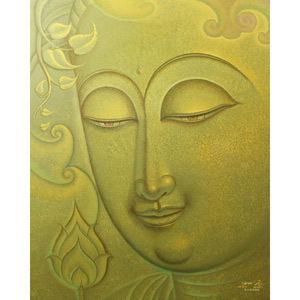 Mara was jealous and, accompanied by his armies, he challenged Buddha. Buddha stretched down his right hand and touched the earth, summoning Mother Earth to be his witness for his good merits. The earth deity in the form of a beautiful woman rose up from the ground and twisted her long hair. Torrents of water, representing the merits that Buddha had earned in the past, came out of her hair, washing away Mara's army. 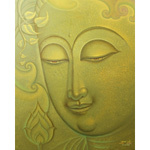 Mara finally recognized that the merits of the Lord Buddha were greater than his. Buddha was freed to reach enlightenment.